The DOH-20D model has been discontinued. Please see the DOH-SD1 as a possible alternative or contact our Flow Engineering Department. 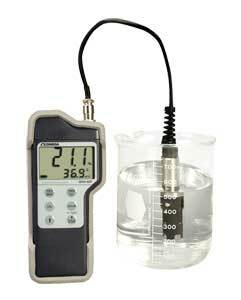 The DOH-20D portable microprocessor-based dissolved oxygen meter is designed for convenience and easy operation. The DOH-20D is equipped with a custom LCD that can display dissolved oxygen (DO) in either mg/liter or % saturation and temperature. It can store up to 16 sets of temperature and DO values. An optional RS232 feature allows the user to download stored values to a computer. The exterior is padded with a rubber casing. Whether your application involves a fish tank, food processing, a lake’s oxygen level or BOD (biological oxygen demand), OMEGA has a dissolved oxygen meter to fit.